Apart from its origin as an object of religious devotion and a prized piece of German Renaissance art, the "Madonna and Child in a Landscape" is now famous because it was seized by the Nazis as loot. That's why curators at the Austrian Museum of Applied and Contemporary Art, known as MAK, asked to borrow the painting to round out the exhibit "Recollecting: Looted Art and Restitution," which opens Wednesday and runs though Feb. 15. "It's a great poetic conclusion to the story," said John Coffey, deputy director of art at the N.C. Museum of Art. "It furthers the conversation of cultural property, who owns it and how it should be managed." In 1984, the painting came to the N.C. Museum of Art as a bequest by a California couple. It was mounted in the European art gallery as part of the museum's permanent collection. But in 1999, the Commission for Art Recovery of the World Jewish Congress notified the museum that it had a piece of looted Nazi art. Two elderly Austrian sisters -- Marianne and Cornelia Hainisch of Vienna -- claimed the painting belonged to their great-uncle, Philipp von Gomperz, a wealthy Viennese Jew. As various documents attested, Gomperz was forced to turn over his art collection to Nazi police at the outbreak of World War II. 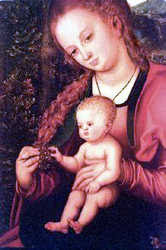 His Madonna and Child landed in the palace of Vienna's Nazi governor. After a months-long investigation, the museum concluded that the sisters were right -- and relinquished its claim to the painting. But then, under the terms of a unique agreement, the sisters sold the painting back to the museum for $600,000, half its estimated value. "Sotheby's Withdraws Fake Belt Buckle"
Germany a Haven for Cypriot Antiquities? Bob Mondello on "The Memory of Mankind"